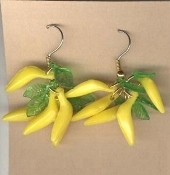 Miniature BANANA BUNCH EARRINGS - Funky Monkey Tropical Fruit Luau Food Bead Charm Jewelry - Really A - PEELING to wear ! Mini vintage plastic 3-D beads. Yellow BANANAS with Green Leaves charms. Bunch approx. 7/8-inch (2.19cm) high. Why not GO APE wearing these? !